The Ocean Lovers Club strives to make a small impact in a big way on the issue of plastic pollution in our oceans. For the dedicated members of the Ocean Lovers Club at UC San Diego, Saturday mornings are for beach clean-up. They dot the sand around La Jolla Shores, reusable canvas bags and gloves in hand. They bend to pick up stray bottle caps and scoop up the endless, tiny pieces of plastic that wash up onto the dunes of the wet sand. The amount of plastic is rather astonishing. A glimpse at the glittering waves of La Jolla Shores and its pristine sand doesn’t capture the amounts of littered plastic it truly holds. A closer look at the sand reveals the plastic pollution that we hear about on the news but often don’t recognize. 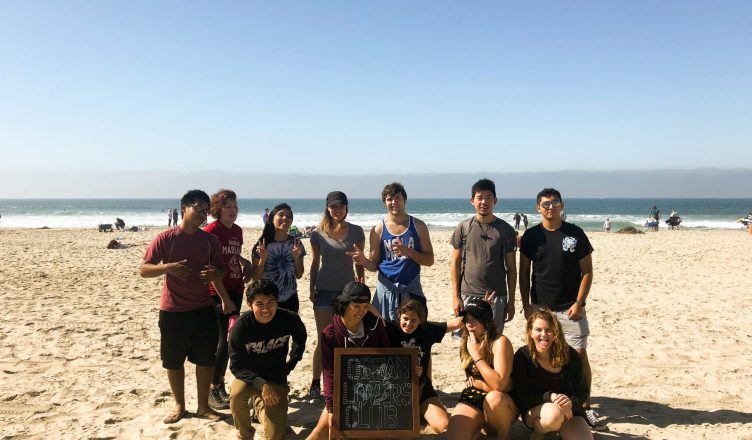 The beach clean-ups are meant to open the eyes of students who care about keeping their oceans clean, as well as to contribute to solving the problem itself, however small the contribution may be. Alexis Durham, the president of the club and an Eleanor Roosevelt College senior majoring in social psychology, describes how most newcomers to the beach clean-ups are struck by how tiny the pieces of plastic are. As bigger pieces of plastic are broken down by water and sun over time, they become harder and harder to eliminate. Lucille Bell, a Thurgood Marshall College junior majoring in visual arts, appreciates the hands-on nature of the beach clean-up. As she bends down to sort through the minute pieces of plastic in the wet sand, she describes how cleaning up beaches inspires her to adapt her lifestyle to a more waste-free approach. The Ocean Lovers Club first took shape when Jack Shurtz, a Sixth College senior majoring in marine biology, met Durham, and the two of them decided to use their passions for their environment to form a group focused on ocean conservation. Since then, the Ocean Lovers Club has added a number of other events to their activities. Bell describes a personal favorite where a professor taught the group about the prevalence and harmfulness of microplastics. Shurtz was in charge of arranging a research expo last quarter, inviting professors, graduate students and researchers well-versed in marine biology, environmental studies and the like to speak to students about their work and how they can make a difference. It’s particularly important to Shurtz that those researchers come from a wide variety of fields, and that they’re knowledgeable about applicable, real-world environmental issues. The Ocean Lovers Club members feel they are contributing to both a national and worldwide issue — even if they’re starting at the local level. All of them have ideas about how to reduce waste and protect the planet’s oceans. Bell thinks that though often much blame is placed on the consumer, it is the big-time corporations that create the most waste and force their customers to do the same. Durham concurs. For her, plastic food packaging is one of the main problems in the amount of waste the average American creates each and every day. The members of the club have varying opinions about how UCSD is doing in their pursuit of a sustainable campus. Bell commends HDH for offering reusable containers and utensils, and for stopping the distribution of plastic straws. But she thinks there is much work to be done, especially at the Oceanview Terrace dining hall, where there are no reusable dish options. She recommends students speak up about the issue to the UCSD Inter-Sustainability Council, of which the Ocean Lovers Club is a part. Shurtz agrees that the Inter-Sustainability Council holds a lot of potential to promote change at UCSD. Though she admires the passion of the groups on the Inter-Sustainability Council, Durham thinks there is much more that needs to be done at UCSD, also citing the issue of plastic usage at Oceanview Terrace. She points out that the decisions the university is making as a company do not always line up with the sustainable goals they have for themselves. Shurtz encourages students to do all they can locally to help reduce waste and plastic usage, as plastic pollution in the ocean is a problem which affects each and every world citizen. As plastic is broken down into smaller and smaller pieces, it makes its way into the stomachs of sea life, harming or even killing them. The consequences extend to life out of the ocean as well. Humans eat the seafood that has ingested the plastic they’ve polluted, potentially harming their own health as well. Durham also thinks that the way to make a change is to start with students. The strategy might be to start small, but it nonetheless makes a big difference. She uses her own coffee mug to get coffee two times a day and points out that she would produce much more waste if she used a disposable cup. Furthermore, she emphasizes the fact that students underestimate the powers their voices have at initiating change on the UCSD campus.